While the Girls' Development Academy celebrated its opening weekend on September 2, Houston Dash Youth was dealing with destroyed homes and schools, flooded streets and additional damage caused by Hurricane Harvey in South Texas. For the club's players and coaches, the Academy season seemed to be on an indefinite hold. Yet, the club provided a framework for contacting players and providing assistance around South Texas. Remarkably, Houston Dash Youth was still determined to make its first road trip of the season to Kansas City to face FC Kansas City and SPORTING Blue Valley. After missing nearly two weeks of training and cancelling its opening games, the club resumed practice on the Tuesday after Labor Day as overcrowded schools reopened, trying to accommodate students from schools still under flood waters. Dash Development Academy Director Nick O'Shea knew that three days of fitness wouldn't physically prepare his team, but that wasn't why the trip was important. "Returning to normalcy and routine is key after something like this," O'Shea said. "Even when we started up practice, the parents said the same thing 'we're glad you're practicing, we just have to get to doing things that we normally do… We had parents still not back to work, we had kids travelling who hadn't been to high school in over two weeks and they didn't know which high school they'd be attending." More than 100 players from the Dash's Academy teams made the trek North, and were met with an enormous outpouring of support. Both FCKC and SPORTING Blue Valley teamed up to fundraise and donate to the Dash's relief fund. At the end of its matches, the club was presented with a check for Hurricane Harvey recovery. Raffle sales and donations from the two clubs totaled over $2,500 for the Academy families impacted by the storm. "It's just really sad but it's good to see everyone come together, help one another and help families out even if you don't know them," Dash U-15 player Cadyn Hulse said. "Everyone understands the enormity of the event that happened in Houston," said Matt Briggs, FCKC Academy Director. "Soccer comes second to something like that… and if we can help in any small way, I think that's what everyone was willing to do." While most immediate needs have been taken care of, O'Shea recognizes that there will be issues going forward. One Dash parent required surgery after contracting an infection while assisting in relief efforts. Additional reports of ailments related to the flooding continue across the Houston market. Area clubs have had to cancel practices due to the increase of mosquitos from the storm. While the city begins to heal, FC Kansas City and SPORTING Blue Valley's generosity will help Academy families resume some normalcy on the long road to recovery. "On behalf of the club, I would like to thank everybody for the support that we have received over the last two weeks pertaining to our efforts in dealing with the aftermath of Hurricane Harvey and the Disaster Relief Assistance," O'Shea said. "So many people have offered their support in multiple ways. It's been outstanding and our soccer families are very appreciative of the help." 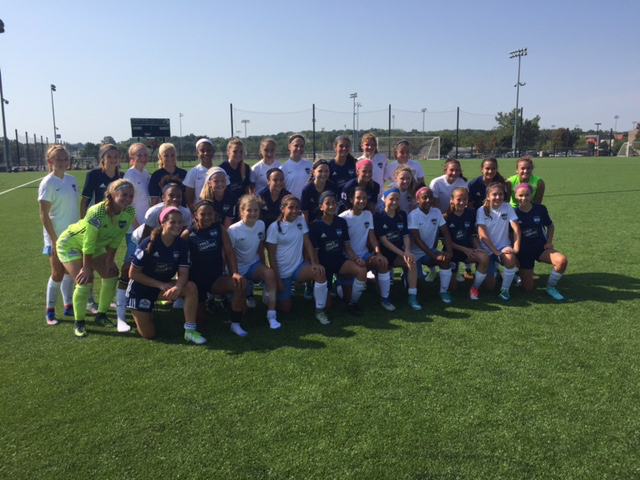 The Girls' Development Academy is currently in its inaugural season. In addition to high level competition on the field, it's clear that the Academy also features world-class people off-the-field in its players and coaches. "The Girls' Development Academy is not only about players, coaches, and community on the field but off the field as well," said Katie Cole, Girls' Development Academy Frontier Division Technical Advisor. "It was a huge gesture and a great example to follow as the FC Kansas City and SPORTING Blue Valley staff, players, and parents stepped up to help other Development Academy families in need. I could not think of a better way to start the Academy season off in the Frontier Division!" You can donate here to directly help Dash Youth players and their families devastated by Hurricane Harvey.